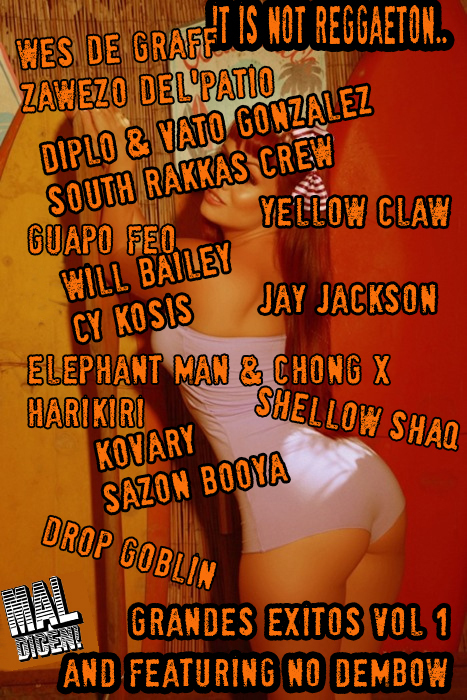 “It is not reggaeton, it is Moombathon: Grandes Exitos vol 1! Since its inception in late 2009, moombahton has soared to the roof like no other music genre in that short term. Grandes Exitos Vol 1 brings something Latino Resiste (or Mal Dicen! in this particular case) is famous for, to gather well known and partially unknown artists under one roof. You will find from the well known Moombah supporters and producers Diplo & Vato gonzalez, Will Bailey, Sazoon Booya, Guapo Feo to less known acts like Harikiri, Chong X, or totally unknown for many like Zawezo del’Patio or Jay Jackson. This compilation more than any other one out there is an answer to the always raising questions during this creative process like “would moombah be able to create a unique sound? or would be always be called the dutch-house reggeaton? would it need a core, soul, trap, or fusion to sound moombah? and many more. Grandes Exitos Vol 1, has no dembow, although it cannot deny it is dembow inspired. The compilation may be a great example for introducing people to the genre who had never heard about it, or keep refering to moombahton as a reggaeton. Sounds from India, Puerto Rico, USA, China, UK are present as much as European Electronic Styles, making this a whole Global movement! All the tracks were set for FREE download by the artists, or donated to us by the artists/labels themselves. THIS IS THE OFFICIAL MIXTAPE made by the talented ViciouzViv, in where you can see one of the unlimited possibilities the compilation can help your sets as well!